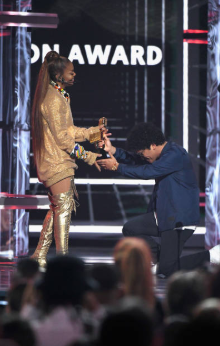 Bruno Mars bows down to the legendary Janet Jackson while presenting her with the Icon Award at the 2018 Billboard Music Awards held at the MGM Grand Garden Arena on Sunday (May 20) in Las Vegas. During her acceptance speech, Janet referenced the Me Too movement. 以上速報でした。Thank you for reading this.